President and CEO of AT&T Mobile and Business Solutions Ralph de la Vega said Tuesday that phone subsidies will soon vanish as customers move away from two-year commitments in favor of new financing plans. According to Re/code, de la Vega believes customers will increasingly choose cellular plans that spread out a handset's full cost over a set period of months. Unlike traditional two-year models, customers don't have to pay an up front fee and have the option to trade in their phone for newer hardware once the term is complete. "I think it is one of those options that is going to go away slowly," de la Vega said. The comment comes a year and a half after AT&T CEO Randall Stephenson said carriers will inevitably need to wean subscribers off handset subsidies. Initially, subsidies were instituted to ameliorate the cost of high-priced smartphones, thus incentivizing customer growth and billings. With higher penetration, early subsidy models become unsustainable, Stephenson said at the time. 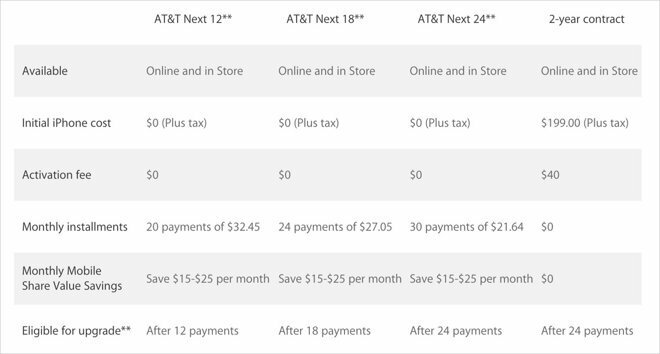 AT&T already fields an installment program called AT&T Next that spreads out full handset pricing over 20, 24 or 30 months, with upgrade eligibility kicking in after 12, 18 or 24 payments, respectively. De la Vega believes plans like Next are just as beneficial to consumers as they are for carriers. Flexible options let power users choose a path that upgrades annually, while those not concerned with cutting edge hardware can select longer terms that bring lower monthly fees. Almost two-thirds of all smartphone sales last quarter were sold without subsidies, the report said. AT&T seems keen on accelerating that transition, however, as it enacted a new policy last week that bars third-party dealers from selling two-year contract pricing. Among those affected by the change is the Apple Store.